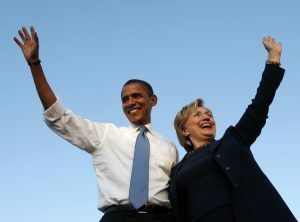 With Hillary Clinton on the verge of securing the Democratic nomination for president, Obama is on the verge of formally endorsing his former secretary of state and starting to aggressively make the case against Republican Donald Trump. White House officials say the announcement could come within days, although not before Democrats in New Jersey, California and four other states vote Tuesday in contests expected to solidify Clinton’s claim. On Monday, Clinton noted the timing has symbolic weight: Tuesday marks eight years since her concession speech and endorsement of Obama after their 2008 primary showdown. White House and Clinton campaign aides have been discussing the sequencing of the long-expected announcement, and Obama’s schedule has several possible opportunities for maximizing the impact. On Wednesday, he’s due in New York City to address donors at a Democratic National Committee fundraiser in Clinton’s home state. He’ll also tape an appearance on “The Tonight Show Starring Jimmy Fallon,” a favorite with the coveted young demographic, for the show set to air Thursday night. Obama’s expected declaration comes as no surprise. Last week, he declared the Democratic contest was “almost over” and suggested he was waiting for the Tuesday contests before making his move. The president said he’s been waiting on the sidelines “rather than be big-footing the situation,” to ensure voters are deciding the outcome. Still, he’s hardly been silent about his personal preference. At key moments, Obama has offered high praise and needed defense for his former rival-turned-adviser, and little comparable support for Sanders. The White House and the Clinton backers are hoping the moment will serve as something of reset button, ending the surprisingly long and contentious primary and refocusing Democrats on the history in the making — Clinton would be the first female, major party nominee — and the job of defeating Trump. White House officials say the president is planning to be a steady and active player on the campaign trail, particularly in the fall. It remains unclear whether Sanders and his backers are ready for reset. Although the Vermont senator is looking at an insurmountable delegate deficit, he’s not said he’ll go quietly. Asked on Monday whether an Obama endorsement of Clinton would affect his campaign, Sanders deflected, saying he was being asked to speculate before an important primary in California. Some Sanders backers may say that process is rigged, but White House spokesman Josh Earnest on Monday suggested the president had no qualms about the math. Obama has strong reasons to want to be seen as a uniter rather than an anointer. Among his political tasks on the campaign trail will be bringing along the young, progressive voters who have been a key part of his base but have lined up behind Sanders this year. The president has wanted to retain his goodwill with those voters, as well as other parts of his loyal coalition that have helped boost his approval rating in recent months. White House officials say the president is planning to be a steady and active player on the campaign trail, particularly in the fall. Unlike recent sitting presidents, Obama remains popular enough to be welcome in both swing states and Democratic strongholds. Associated Press writers Catherine Lucey in Los Angeles and Ken Thomas in Emeryville, Calif.